Raise a Green Dog! : Just because it's fall doesn't mean ticks aren't a danger to your dog! Just because it's fall doesn't mean ticks aren't a danger to your dog! It was nearly one year ago that our Gracie woke up one morning went out to do her business and collapsed in the yard. I picked her up and discovered that she was very, very warm. Immediately I took her temperature and found she had a dangerous fever of 106 degrees. Quickly we jumped in the car and rushed her to the vet. 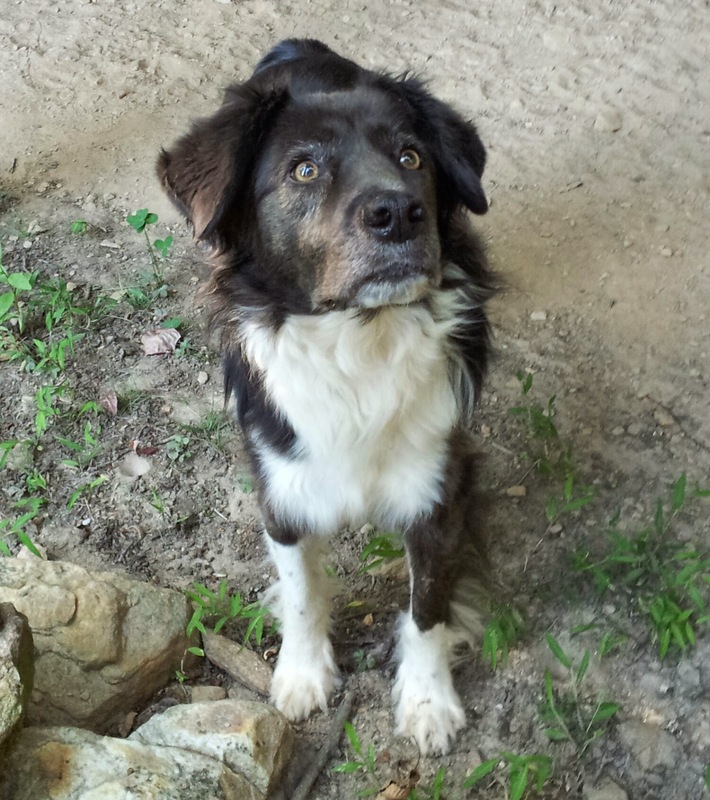 Mum instantly knew that it was a very good possibility that this was a dangerous tick disease, as we have American Dog Ticks here on our mountain that transmit Rocky Mountain Spotted Fever. Gracie was immediately treated and her fever started to subside, but the neurological symptoms persisted for a few days. After about a week, she was back to her normal, wonderful, goofy Gracie self, but Mum was glad she didn't know at the time just how close Gracie was to death. Ticks can be very, very dangerous for dogs. If infected, they can transmit Lyme, Tick Paralysis, Ehrlichiosis, Anaplasmosis and more. 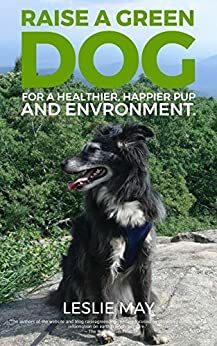 Raise A Green Dog Partner, Earth Heart Inc., has put together a wonderful article on their blog outlining facts about ticks that are little known to most dog lovers. 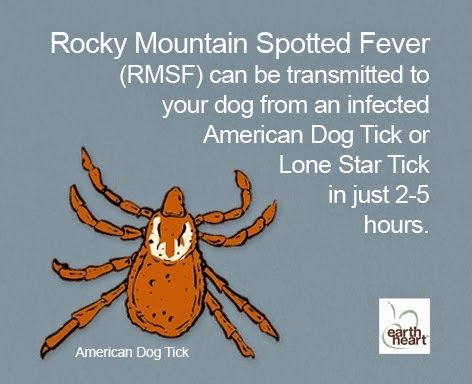 For example: before Gracie got sick, we had no idea that ticks infected with Rocky Mountain Spotted Fever can transmit the disease to your dog within 2-5 hours after a bite. During that time frame we never saw a tick on Gracie; and assumed that it bit her and fell off very soon after. Over the counter tick preventatives including spot ons, collars and sprays not only contain dangerous chemicals that can be harmful to your dog, but they state they may take up to 24-48 hours to kill ticks; concluding that none of these would have helped prevent Gracie from contracting RMSF. So what do we do now? We utilize products including essential oil sprays containing Neem sprayed on Mum's hands and rubbed into Gracie's (and YoYo's and Rach's) fur; we spread Food Grade Diatomaceous Earth to kill ticks in our yard and rub a little in our dog's fur, and occasionally we'll spray a garlic or cedar based spray just outside the fence area of our yard to further repel ticks from entering our yard. Why do we use these items? Because the only way to keep ticks from infecting Gracie, YoYo and Rach are to repel them and keep them away. And by using these products we are keeping our dogs healthier by not exposing them to dangerous chemicals that could affect their health, well being and immune system. Remember, fall is one of the best times to get out and enjoy nature with your dog! But also remember that ticks are prevalent and prolific this time of year, and well into winter in the southern states. So we encourage you to read more about ticks and learn how you can repel them from your dog! 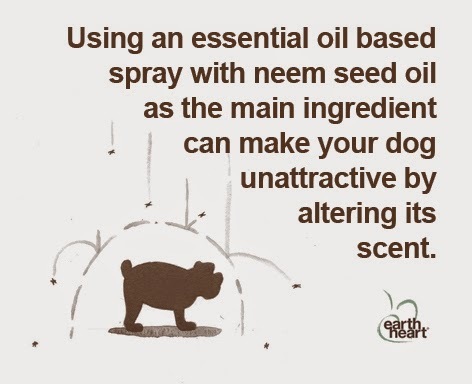 And if you'd like to try Earth Heart's Buzz Guard that contains Neem to help repel the ticks on your dog, enter our giveaway below (available to US and CAN dog lovers only, please). We are giving away one bottle to three winners on October 10th, so you have until midnight on that day to enter! Good luck!